They’re all La Trobe students, and they’ll all receive academic credit for their work on the site this semester after enrolling in our subject, Online Editing and Publishing. If you have a story you’d like us to consider for publication, or you have ideas about something you’d like to write about for upstart, please check our Notes for Contributors and don’t hesitate to get in touch with the team via email: contact@upstart.net.au. Susannah Woolley is a third-year Bachelor of Journalism student at La Trobe University and the editor of upstart magazine. She is an aspiring fashion journalist who has written for Dalliance Magazine and worked in digital production at The New Daily. She is an enthusiastic magazine collector and is particularly passionate about sustainable fashion, the environment, politics and social issues. She moved to Melbourne from Tasmania in 2011 with the intention of completing an undergraduate degree and eating her way around the city’s best cafes. She has been doing so ever since, and looks forward to spending her final semester as editor. You can follow Susannah on Twitter: @susannahwoolley. Susanne Tunge Østhus is a third year Bachelor of Journalism student at La Trobe University. Susanne grew up in Norway, but moved Down Under in 2012. She has since then fallen for Aussie culture and hopes she can secure a job in Australia before her visa expires. Susanne is passionate about politics, travel, culture and technology. When she is not working on assignments, she contributes to the Norwegian publication The Foreigner and does various translating jobs. You can follow her on Twitter: @SusanneTunge. Tam Kendi is a third year Bachelor of Journalism student at La Trobe University. Tam has an interest in politics, world affairs, motor journalism and travelling. He is not only interested in writing, but in different forms of media such as radio and television. Tam is the producer and radio presenter for a Wednesday afternoon show on Melbourne’s JOY 94.9. He aspires to one day be on television, possibly working for a major news network. You can follow him on Twitter: @tamkendi. Erin Leeder is a third-year Bachelor of Journalism student at La Trobe University. She has an interest in film, culture and fair trade and currently blogs, tweets and posts for Seven Women, a growing aid organisation. She also does some social media work for digital storytelling website Betanarratives. Erin’s plans for the future can change as rapidly as the local weather, but honestly, she will probably be happy anywhere where she can write, drink tea and watch the world. You can follow her on Twitter: @155erin. Matt Goss is in his final year of a Bachelor of Journalism (Sport) at La Trobe University. Growing up in Brunswick, he has had access to all the sport Melbourne has to offer and as such developed a keen interest in a range of sports – chief among which are AFL, football, cricket and basketball. Outside of his studies Matt enjoys reading and binge-watching TV series. You can follow his stream of consciousness on Twitter @mattgoss_. Philippe Perez is currently studying a Bachelor of Journalism at La Trobe University. He is a self-confessed radio addict and contributes to programs on SBS Radio, 3CR and 3RRR. Philippe also occasionally makes short audio documentaries for All The Best. He also writes and was previously an interview editor for music and culture website The AU Review and is always up for a nerdy chat about music. He is an avid book reader and has his head in an engrossing novel whenever he isn’t in a radio studio. Follow him on Twitter: @p_perez. Daniel Maynes is a third year Bachelor of Sport Journalism student at La Trobe University. While his first love is sport, he is an avid gamer and a self-professed tech nerd. Daniel has developed a passion for multimedia production and hopes to one day work in a job where he can combine his journalistic skills with his passion for video editing. When Daniel isn’t doing journalism, you can find him spending a little bit too much time tinkering with his Supercoach team whilst listening to some soulful music he has just discovered. You can follow him on Twitter: @Daniel_Maynes. Ethan Miller is currently in his third year of a Bachelor of Journalism degree at La Trobe University. Born in Queensland, Ethan moved to the northern suburbs of Melbourne at a young age. Ethan is passionate about many things, ranging from politics to film and television and hopes to explore many of these topics as a staff writer for upstart magazine. Though not yet sure where he would like to go in future, Ethan knows he belongs in the media industry. You can follow him on Twitter: @ethanmiller1994. Ewa Staszewska is a third year Journalism student at La Trobe University. She believes that journalism satisfies our natural thirst for knowledge and likes the idea of informing people about current affairs. After a semester abroad in Spain, Ewa has a serious travel bug and dreams of travelling around Europe as a foreign correspondent. When she’s not too busy reading or fine-tuning her writing skills, you can find her eating way too many dumplings. Follow her on Twitter:@EwaStaszewska. Joely Mitchell is in her third year of a Bachelor of Journalism degree at La Trobe University. She enjoys writing about health, lifestyle, youth related issues and current affairs. She is the founder and writer for Truth4Youth, a blog that is written by young people for young people. Joely hopes to work as a reporter for a broadcast, online or print publication once she has finished her degree. You can follow her on Twitter: @joely_mitchell. Kieran is currently in his third year at La Trobe, studying a Bachelor’s degree in Strategic Communication. Kieran picked up an interest in writing during high school and has been putting pen to paper ever since. Kieran views the world of journalism as a doorway to information and critique of global events, with a community growing bigger by the day dedicated to spreading and verifying information which at times can get a bit murky and confusing. You’ll often find Kieran browsing multiple online information sources at one time, and engaging with like-minded individuals on Reddit. You can follow Kieran on Twitter: @KieranBlam. Matthew Santini is currently in his third year of a Bachelor of Journalism (Sport) degree at La Trobe University. Having followed a variety of sports from a very young age, Matt developed a fierce passion that has led him to pursue a career in the media. As a staff writer for the upstart team in 2015, Matt is looking forward to be covering his favourite sports: AFL, cricket and football. Follow him on Twitter @MattyValentino. Nat Kassel is a Melbourne-based freelance writer and third year Bachelor of Arts student, pursuing a double major in journalism and anthropology. Hailing from northern NSW, he likes warm weather and sand between his toes, but considers Melbourne’s cultural pros outweigh its cons. Aside from his role at upstart, he dabbles in creative non-fiction and is the assistant editor of Global Hobo. Nat’s passions include skateboarding, sustainable eating and spectating live music, especially the loud and abrasive kind. You can follow Nat on Twitter: @natkassel. 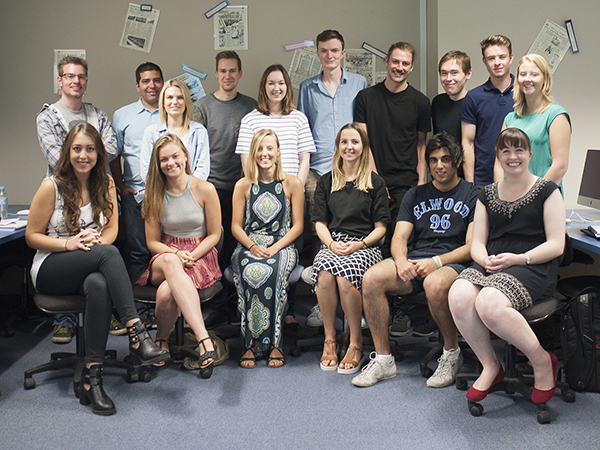 Nick Harrison is in his final year of a Bachelor of Journalism at La Trobe University. He loves travelling and it was the prospect of working abroad as a foreign correspondent that first attracted him to a career in the media. In 2013 he was lucky enough to go on exchange to the University of Oregon, in the USA, where he honed his journalism skills and got a taste of American college life. He is particularly interested in politics and enjoys reading and writing political satire. In his free time he enjoys playing sport and reading novels. You can follow him on Twitter: @HarroNick. Stephanie Atkins moved from a small town in country Victoria to pursue a Bachelor of Journalism degree at La Trobe University. She is currently in her final year and has aspirations to become a television news reporter. Some of Stephanie’s interests include – but are not limited to – news and current affairs, entertainment, sports, cups of tea, and sharks. She is widely traveled, with an appreciation for life in Australia. This self-proclaimed lover of the English language has published work for Magnify Melbourne and The Australian Clay Target Association. You can follow her on Twitter: @_steph_atkins_. Tijan Biner is in her final year of a Bachelor of Journalism degree at La Trobe University. During her time at La Trobe, she has interned and contributed to a number of publications, as well as starting her own fashion blog. When it comes to writing, her interests are fairly diverse. One minute, you’ll find her obsessing over the latest fashion trend, then passionately expressing her views on animal cruelty the next. Whichever it is, she knows she’ll be happy as long as she’s writing. You can follow her on Twitter: @tijanb.